Nominal impedance is 4 ohm for WF146WA01 and 8 ohm for WF146WA02. Otherwise the two models are identical. 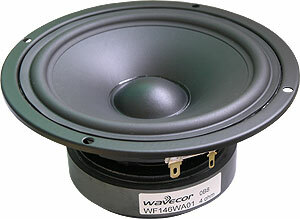 WF146WA01/02 are mid/woofers designed for demanding bass and midrange applications. They work equally well for high-end hi-fi, high quality home theater systems, and top multimedia setups. field in the air gap. WF146WA01/02 are very good choices for compact 2-way speaker systems or even as midrange in multi-way systems.